Make this product worth every penny of its purchase. Stability and durability are essential in any commercial product. The Sole LCR Recumbent Bike will challenge any user regardless of their fitness level, with its heavy flywheel plus 40 levels of resistance. 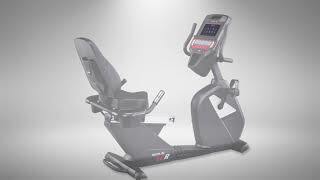 The LCR also includes Bluetooth capability, allowing users the freedom to transfer workout data to their smart device. Users can track their fitness data on the Sole app, or transfer their data to other compatible fitness apps. Adjustable Seating – Allows a user to move forward and backward on the seat. Because all users differ in height it is important to have the freedom of finding that perfect comfort level during a workout. Display – Easy console viewing prevents workout frustrations. Displaying workout info on a large screen is vital for meeting workout goals. Easy viewing means fewer distractions and more achievements. Frame – A strong durable frame is vital for Commercial bikes. Heavy Steel tubing along with aluminium shroud makes the Sole bikes indestructible but light and manageable. Two wheels up front make moving the bike easy and convenient.